Three new polls put the Democratic margin over Republicans in the generic ballot House vote at +10, +11 and +9. Those are slightly below the previous trend estimate of +11.4, and with these new polls added, the trend estimate now stands at +10.8. This still leaves a relatively flat trend following about a 1 point decline in the Dem margin. 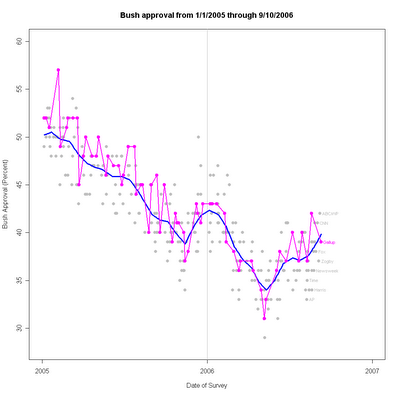 As I wrote here yesterday, the surge in support for President Bush (to 42.2% today, see here), appears not to be driving the generic ballot, at least not yet. The trend estimate has remained between +10 and +12 for the last 150 days or so, though with some small cyclical movement. Three new polls all tell the same story today. Approval of President Bush stands at 42% in new Fox, Hotline and Zogby polls. And the current trend estimate is now 42.2% to boot. The Fox poll was completed 9/26-27/06 among 900 likely voters, finding 54% disapproval. The Diageo/Hotline poll was done 9/24-26/06 interviewed 800 registered voters, and got disapproval at 56%. The Reuters/Zogby telephone (not internet) poll was done 9/22-25/06 among 1000 likely voters, and has 58% disapproval. All three polls also show increases over the past two or three polls. This week's developments with former President Clinton's outburst on Fox, and his advice on Russert to Democrats about how to campaign on security, plus the leak and then release of the National Intelligence Estimate and surrounding debate, plus the White House response to both these, raises an interesting question of what comes next for Presidential approval. It is my impression that the White House has held the initiative in political debate over the past several weeks, with little effective Democratic response (this is just my impression-- I have no direct data on this). Certainly the observed data demonstrate that the White House has "won" the last 5 weeks. So where is the Democratic counter attack? Was Clinton attempting to lead his party in a new offensive? Or am I wrong and Democrats have in fact been actively responding to the President? If so, it hasn't worked very well, has it. Either way, now what? After a flurry of polls indicated a dip last week, the generic ballot for the House now appears to have stabilized. Last week the Democratic lead (that is, Dem% minus Rep%) fell from +12 to +10. New polling however suggests that the dip was less and now estimates the Democratic lead at +11.4%. 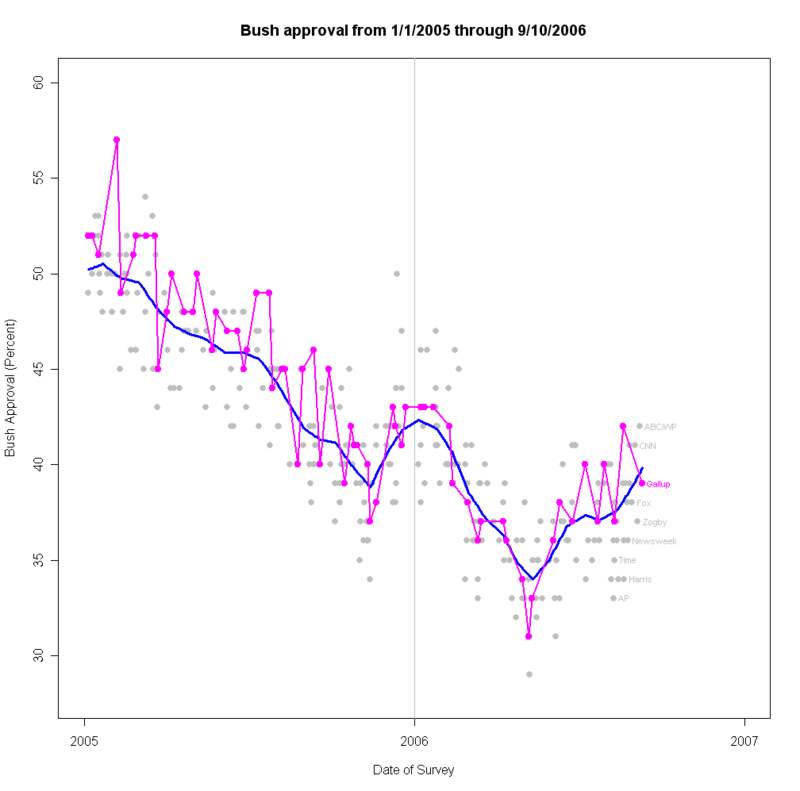 More important, the upturn in Bush approval rating that remains quite strong now appears not to be driving the generic ballot, as it seemed to be doing last week. 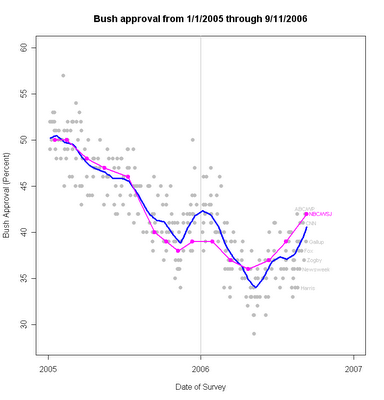 (See the latest approval trend here.) With the new data, the dip appears mild and the trend is now flat. This is not out of line with Senate polls which have so far failed to show a move in the Republican direction over the past couple of weeks. 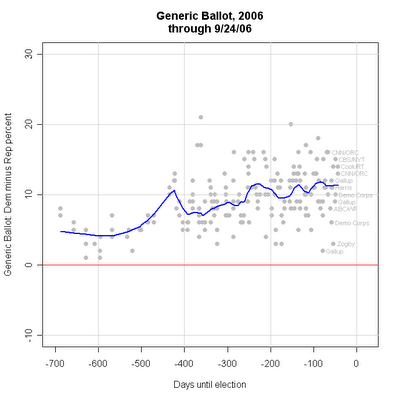 The range of values on the generic ballot is striking. While all polling is variable, it is clear from the polls indicated in the right of the figure, that this question produces a strikingly large range of results. In part this is a simple artifact of the measure being the LEAD of Dems over Reps. The variability of a difference is larger than the variability of either of its components. So if the margin of error for the Dems and for the Reps is 3%, the margin of error for the difference is close to 6%. 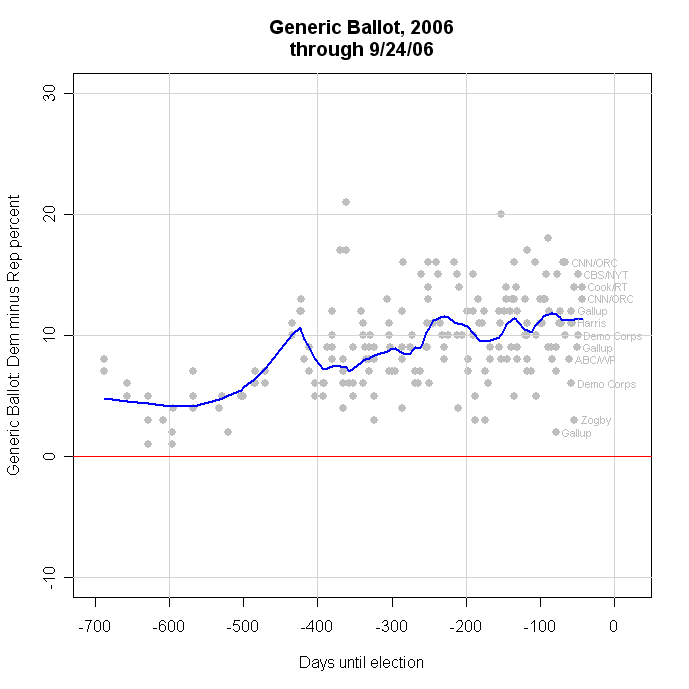 Even so, readers would be well advised to be wary of highly variable polling on the generic ballot. A lot of attention is being paid to this measure which is certain to vary a lot from poll to poll. Simply looking at the latest poll compared to the previous is likely to vastly overstate amount of change that is taking place. 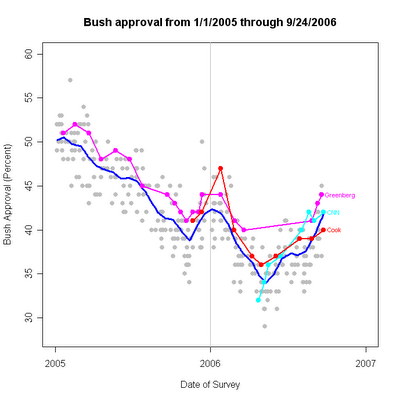 That variability also means it is hard to know precisely where the measure stands, based on individual polls. The trend (blue line in the figure) is the best estimate. And remember, translating the generic vote margin into seats is also an uncertain business. See here. 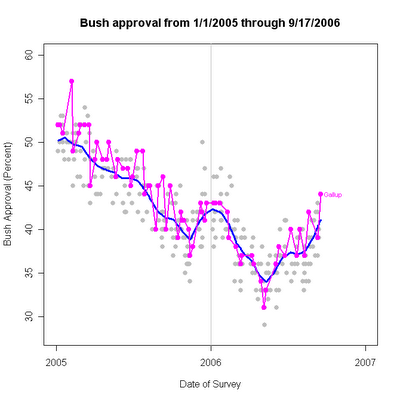 These results neatly bracket the trend line, which now stands at 41.8% approval. We continue to see the usual variability across polls, but the upward trend has been consistent across a substantial number of polls since mid-August when the current upturn began. So far there is no indication that the rate of increase has changed, and that rate is sharper than either of the two previous rallies since January 2005, having risen some 5 points in 5 weeks. While these two polls disagree with each other, they are consistent with my trend estimate, though at the opposite ends of the range of normal variation around the trend. With both polls added, the trend estimate (dark blue line) stand at 41.2% approval. 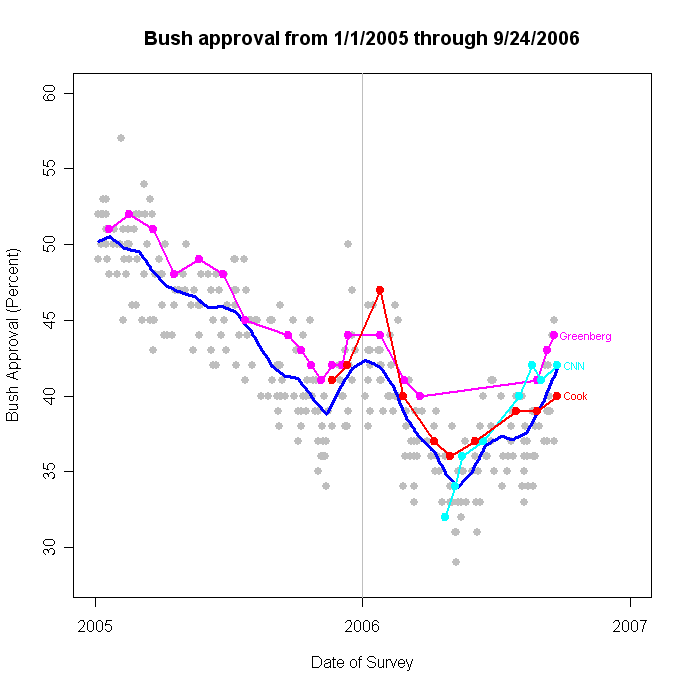 The LATimes/Bloomberg poll finds approval increases across all party categories, from their 7/28-8/1/06 poll. 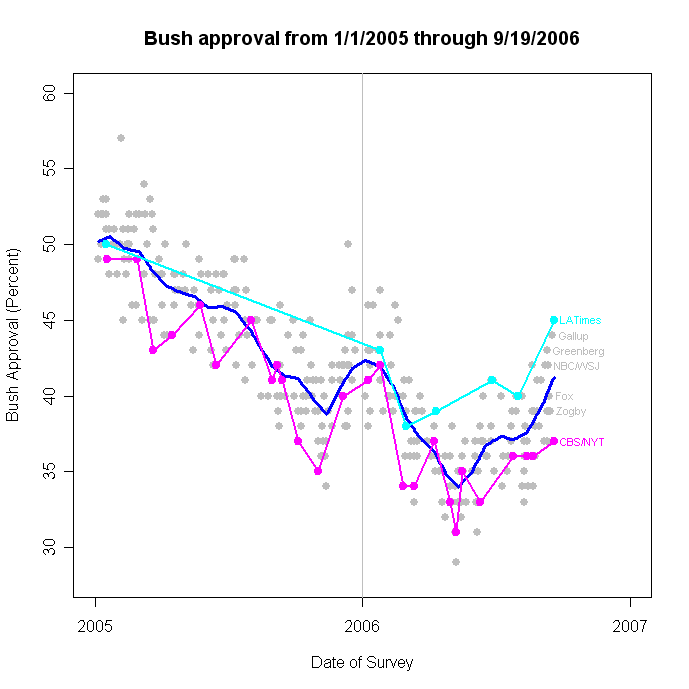 Support for President Bush rose from 77% to 83% among Republicans. Among Independents support increased from 33% to 38%. And even among Democrats the rate rose from 11% to 19%. The latter is interesting given the common claim that opposition among Democrats is so strong that minds are made up and unchangeable. The CBS/NYT found little change among partisan groups, which is in keeping with the mere 1 point change in overall approval. Their approval results were 75% among Republicans, 31% for independents and 9% for Democrats. In their previous 8/21 poll CBS/NYT found 74% Rep, 31% Ind, and 7% Dem approval rates. "I'd like you to compare the way things are going in the United States to the way they were going five years ago. Generally, would you say things are going better today, worse today, or about the same today as they were going five years ago?" "And what is your best guess about the United States five years from now? Generally, if things go pretty much as you now expect, do you think things will be better, worse or about the same as they are today?" "Do you think things in this country are generally going in the right direction or are they seriously off on the wrong track?" CBS/NYT finds only 18% saying things are going better today, 60% worse, and 19% say things are the same. The LATimes poll finds 31% saying right direction and 61% wrong track. In both polls the presidential job approval question follows these opening questions (which is a common placement.) You might wonder if the CBS/NYT invites "retrospective" evaluation of President Bush by the direct comparison of now to five years ago. However, the "worse" response in CBS/NYT matches closely the "wrong track" response in the LATimes/Bloomberg. So if this question order affects the results, it must be because of the temporal comparison in one compared to the current status (without comparison) in the other. The latest Gallup poll finds approval of President Bush reaching 44%, the first time Gallup has been that high in the year since 9/26-28/05. 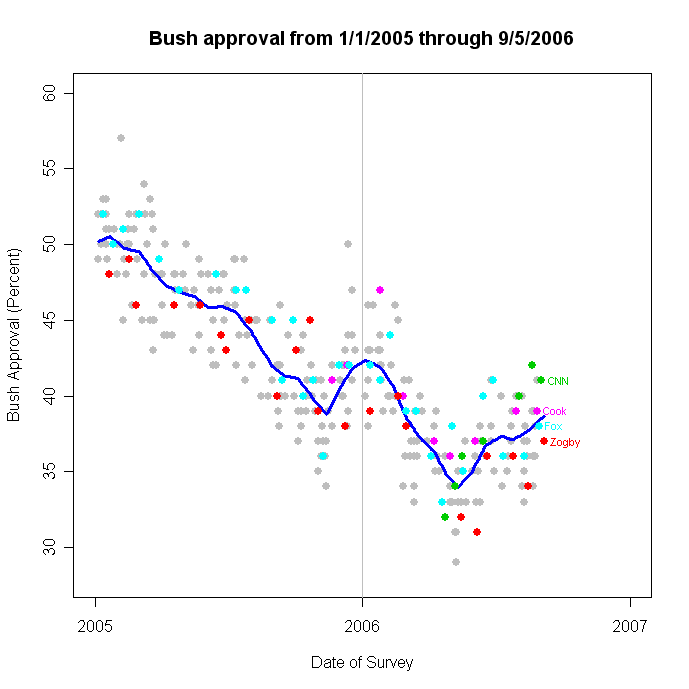 The poll taken 9/15-17/06 also finds disapproval at 51%, also the lowest since September of 2005. With this poll included, my trend estimate rises to 41.1%. As the latest and also highest poll this Gallup exerts considerable influence on the trend estimate, which stood at 40.0% prior to adding the Gallup data. That's a lot of influence for one poll, and it is likely that the trend estimate will adjust down when more polling arrives. Gallup is at the upper end of the normal range of variation around my trend estimate-- not enough to be an "outlier" but certainly at the high end of variability. That strongly suggests that new polls are likely to be closer to 41% than to Gallup's 44%. The result will be some reduction in the trend estimate. At least that's the smart bet. 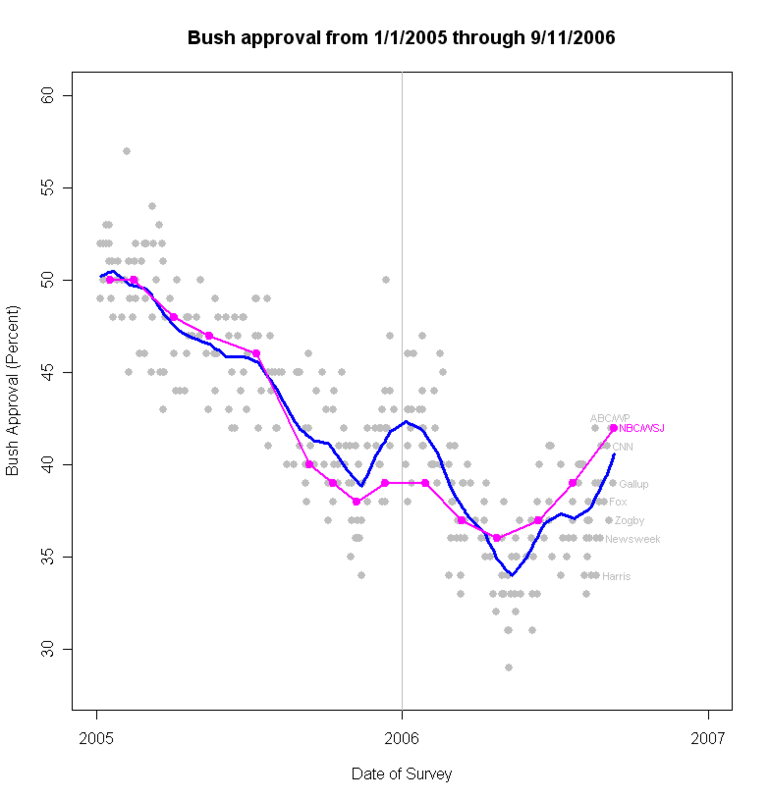 But what is very clear is that the trend in approval continues to move strongly up. This begs the question of how long the trend can last. Previous upturns in November 2005 and May 2006 ran their course in about a month, with a subsequent plateau. The November-December 2005 rise was followed by rough stability through January 2006, while the May-June 2006 increase was followed by a steady 37% plateau through most of the summer. By that standard, it is easy to imagine that the current improvement in approval could easily last through election day. A ton of new polls have arrived since September 1, with a range from 37% approval to 43% approval. The spread is quite even around the trend estimate, which now stands at 40.0% approval. Some polls are in switching from samples of adults to samples of registered or even likely voters. That has caused some concern about the possible effects this has on the approval estimate. NBC/WSJ and AP/Ipsos have provided comparative results which show small affects of the change in sampled population. NBC/WSJ compared June and July samples for both adults and RVs, finding a one percentage point increase in approval (and one point decline in disapproval) in both months, from 37% to 38% in June and from 39% to 40% in July. Interestingly, when NBC/WSJ made the same comparison for CONGRESSIONAL job approval, approval actually went DOWN by one point in each month. The AP/Ipsos polls offers a comparison of Adult, RV and LV samples for their 9/11-13/06 samples. For Adults, approval is 39%, for RV it rises to 41% and for LV it falls back to 40%. 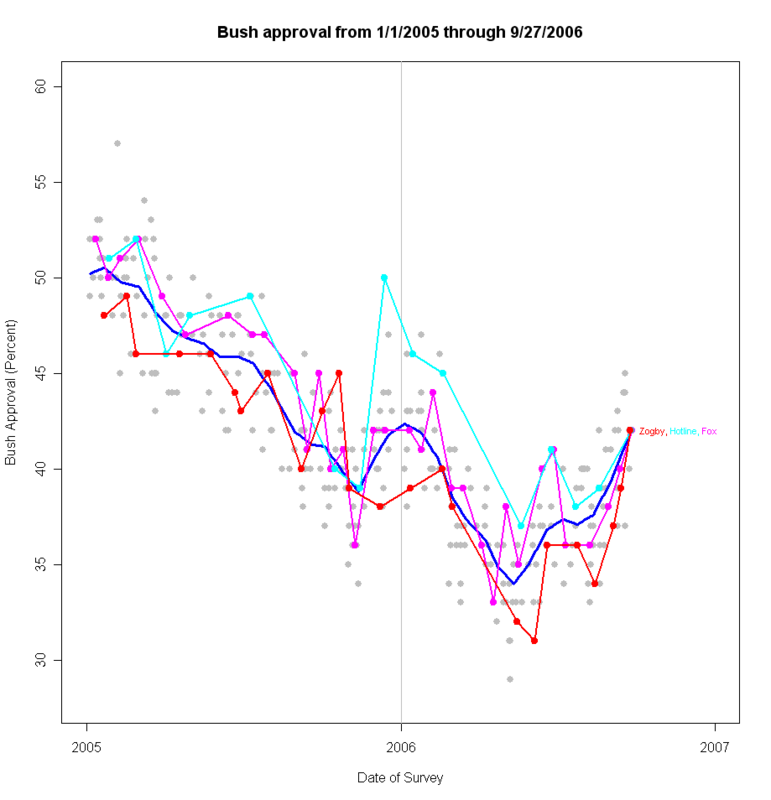 This last result shows that an improvement in Bush approval need not increase as the sample moves to likely voters. Much of the polling so far has found that Democrats are somewhat more likely to say they are certain to vote this fall than are Republicans. 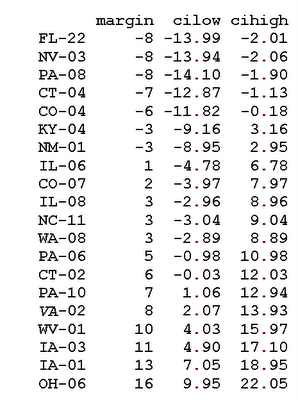 The "discouraged" Republican is a great concern for the GOP strategists and is possibly reflected in this AP data. While Republicans remain more likely to be registered to vote than Democratic identifiers, the traditional Republican turnout advantage may be somewhat reduced this year. Of course, that depends on who actually shows up on November 7, and that's a long ways off still. The NBC/Wall Street Journal poll taken 9/8-11/06 finds approval at 42%, with disapproval at 53%. This is the fourth poll since 8/27 to find approval at 41% or 42%. That makes four of the last eight polls at 41 or 42. The last eight approval ratings are: 39, 41, 38, 41, 37, 42, 39, 42. With the latest addition, my trend estimate of approval is now at 40.6%, the first time the approval trend has topped 40% in some long while. The last reading over 40% was 2/16/06. This continues to be quite a sharp and substantial upturn. A new USAToday/Gallup poll finds approval at 39% with disapproval at 56%. The poll was conducted 9/7-10/06. This is a 3 point drop from Gallup's previous reading at 42% 8/18-20, but is in line to a series of six previous Gallup polls between 37% and 40% taken over the summer. Gallup concludes that approval has been stable for the last six or so polls. With the addition of the Gallup data, my trend estimate stands at 39.8%. The upward trend that has developed since mid-August continues with the addition of this new poll. The effect of President Bush's address to the nation on Monday night, 9/11, is yet to be addressed. 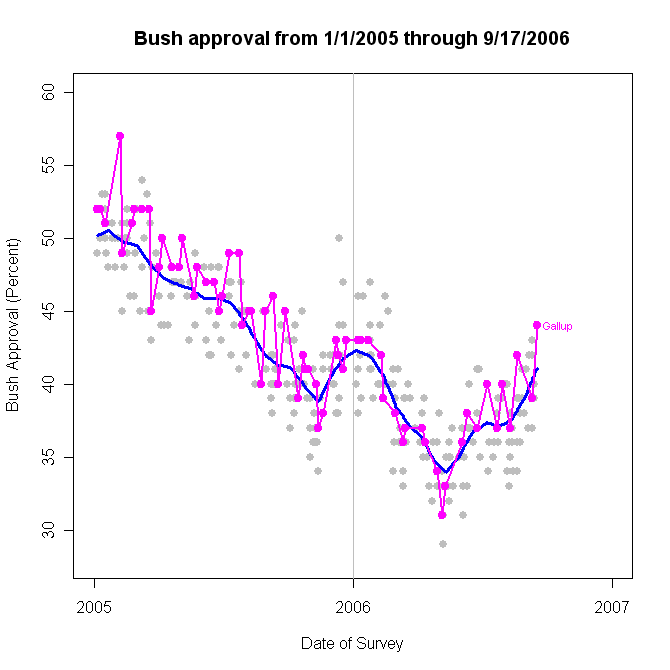 In November 2005, approval increased after the White House began a month-long defense of it's policy in Iraq. The speech last night had many of the same elements, and fits well with the reported strategy of turning the "war on terror" into a positive for the fall campaign. Others argue that this well of support is beginning to run dry. Given that the current upturn (I called it a "surge" yesterday; one of my correspondent's argued for "creep". So let's try the more neutral "upturn" today) is well established prior to the speech, it will be important not to confound continuation of this increase with an effect of the speech itself. As with all analysis here, we'll have to see some 6-12 post-speech polls to get a decent handle on the effect that address may have had. This is a remarkable run-up in approval over a 3 week period. I have been cautious about the increase, anxious to see more polls check in. Those that have, so far, have only strengthened the conclusion that the President's standing is indeed improving. The aniversary of 9/11 will likely produce a number of new polls, which should give us a very wide range of data to strengthen this estimate. Over the summer the trend moved up a bit, down a bit, and was flat for a bit. And revision of the series often showed that the short term movements were more due to the influence of a single poll or two rather than a demonstrable and sustained trend. This move certainly looks more sustained over a number of polls and over three weeks. 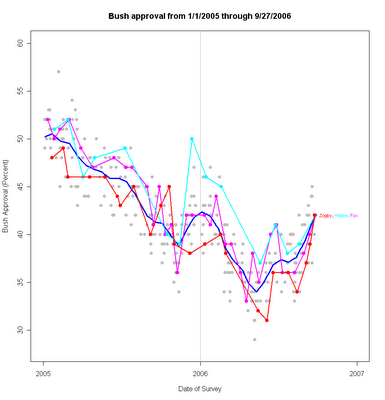 Compared to May, when the approval trend fell below 34%, President Bush has enjoyed a more than 5 point rise in approval. What looked like looming disaster for November, with a President in the low 30s or even the high 20s, now looks like a midterm with a President who has low, but not disasterously low, approval ratings. The current handicapping by Charlie Cook and others is that the Democratic position has strengthened in a number of House races, with some analysts suggesting a 20+ seat gain is not out of the question for the Democrats. If that happens, it will have much to do with the strength of the local candidates, and rather less to do with a wildly unpopular president. 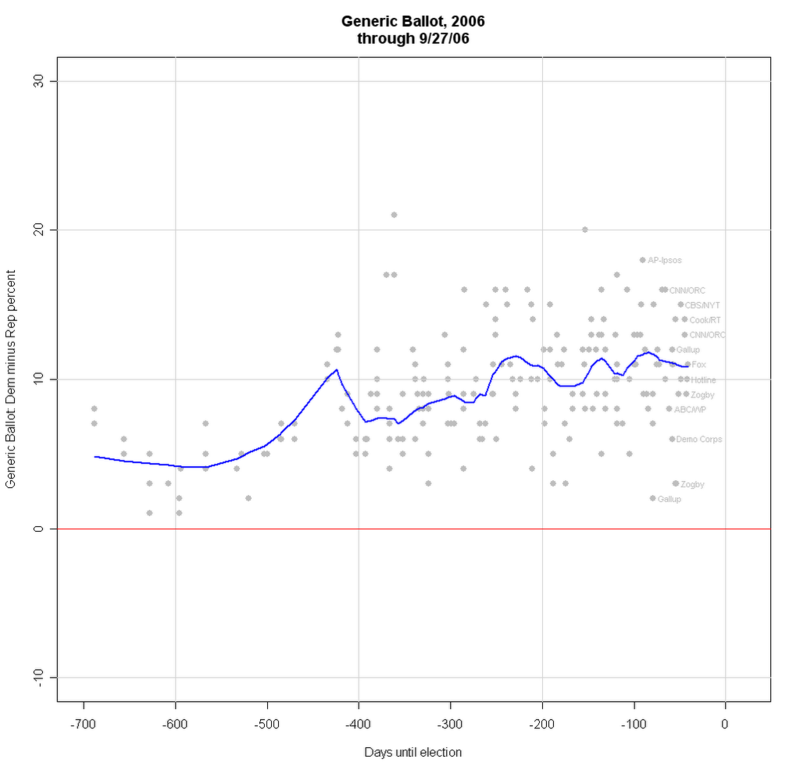 The graph above shows the distribution of the polls, using the margin between Dem and Rep, with the 95% confidence interval shown. Where the margin is greater than 2 standard errors from zero, I've colored the dot dark red or blue; where the margin is between 1 and 2 standard errors from zero I've colored it light red or blue, and where the margin is less than one standard error I've given it just a slight tint. 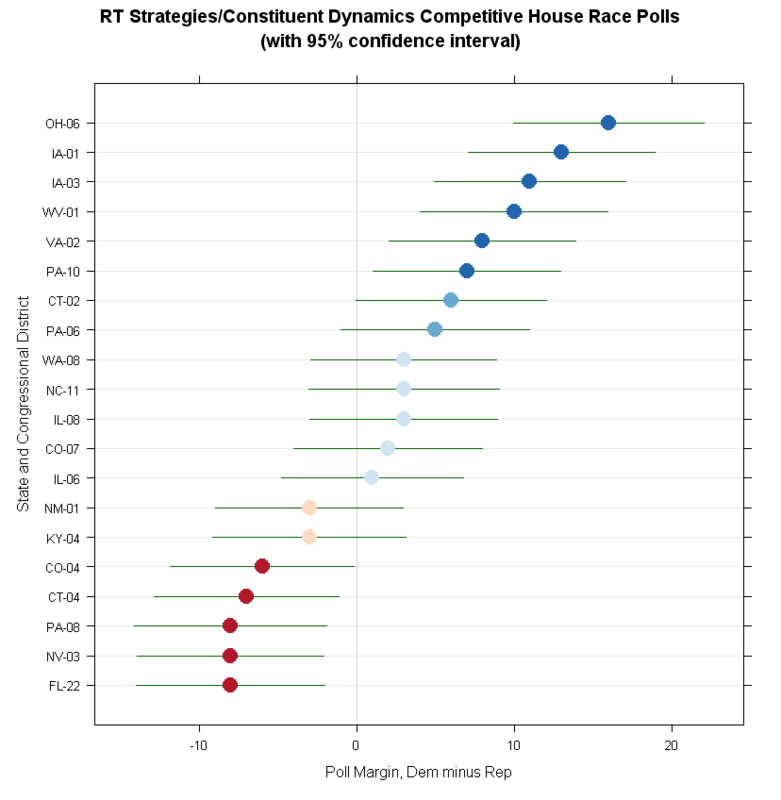 A glance at the figure shows the Dem ahead in 13 races and the Rep ahead in 7. 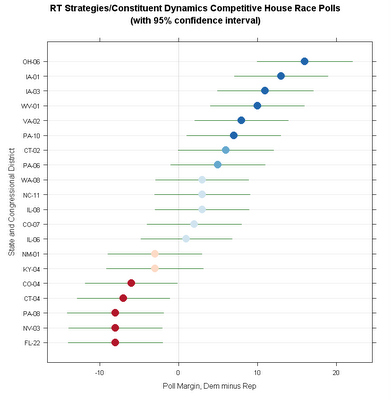 The Rep has a statistically significant lead in 5 races and the Dem in 6. 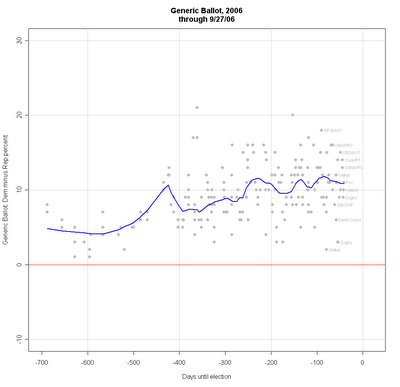 Of those too close for statistical significance, the Dem has an edge in two and the Rep in none. Of the true tossups, the Dem is "leading" (by a statistisical phantom!) in 5 and the Rep in 2. But, these races are overwhelmingly in Republican districts, and there lies the really interesting story. Of these 20 seats, 16 are currently held by Republicans, and 13 have a Republican incumbent seeking reelection. Given the usual incumbency advantage, we should expect these seats to be going overwhelmingly for the Republicans, yet they are not. Of the16 currently Republican districts, seven are leaning Rep, while 9 are leaning Dem. Yet of that 9, only 3 are clearly (i.e. by a statistically significant margin) favoring the Democrat. Two are possibly favoring the Dem, and four(!) are way too close to call though with the Dem ahead by a point or three. Still, to even break even in seats held by the opposition is quite a remarkable acheivement by an out-party. Leading (even if only by a ghost) by 9 to 7 is remarkable. Of the four seats currently held by Dems, three seem secure, with Dems holding a statistically significant lead. In one case, IL-08, the polling shows a very slight Dem lead. If we threw caution to the wind and ignored the confidence intervals, we'd see the potential for a net gain of 9 seats for the Democrats out of this group of 20 districts, or over half what the Dems need to retake the House. If we prefer a bit of caution, we'd see a likely gain of 4-5 seats with 7 way too close to call. And if we were good conservative statisticians, we'd say (maybe!) a gain of 3, with 9 seats too close for a statistically significant lead by either party. Some caution is needed in interpreting these results. The polling was done by "interactive voice response" interviewing, that is a recorded voice asks the questions. This produces very low response rates, though usually from a good sample of telephone numbers. In this case, the survey also used listed numbers only. That is required in order to be sure which congressional district a respondent lives in. But it costs the loss of all unlisted numbers, which can be significant especially in urban areas. This is a common tradeoff in sampling congressional districts, but deserves some caution. This is a great study, even taking the cautions into effect. I hope we'll see more! The races included in this group of 20, and the 95% confidence interval is listed in the table below. The "margin" is Dem minus Rep percent in the table above. While I was busy getting Pollster.com launched, a funny thing happened to presidential approval. Four polls have come in since I last updated, and their collective impact is to raise my trend estimate of approval to 38.7%, a gain of 1.5 points since 8/25. Some caution is due, as readers who have followed the drama of where the trend is going this summer will know. We've seen the trend estimate look up, only to then look down, and to look flat. None of the moves this summer were sharp, but many have started in one direction only to reverse course. So maybe approval is now heading up, and this is a pretty good move in the trend estimate, but it is also possible the trend will again flatten. Let's look at the new polls and see what we can gather from them. The new polling was kicked off by a Cook Political Report/RT Strategies poll taken 8/25-27/06 with approval at 39% and disapproval at 55%. Fox followed on 8/29-30/06 with approval at 38%, disapproval at 56%, a close match. Next came CNN/ORC on 8/30-9/2/06 at 41% approve and 55% disapprove. CNN switched pollsters last spring from Gallup to Opinion Research Corporation (ORC). So far we only have 7 ORC conducted polls. Two of those are right on the trend, one is well below, one a bit high, and the last three have all been quite a bit higher than the estimated trend. Seven polls is too little to get a real tight estimate of the house effect we should expect from the CNN/ORC polls. The last estimate I did with only 5 CNN/ORC polls was near zero but with an expected wide confidence interval. The two new polls since then have both been over 2 points high relative to trend, with one a clear outlier. So we might discount this a bit, given the recent track record. So what does all this say about the current trend estimate? It is not driven by a single high value. 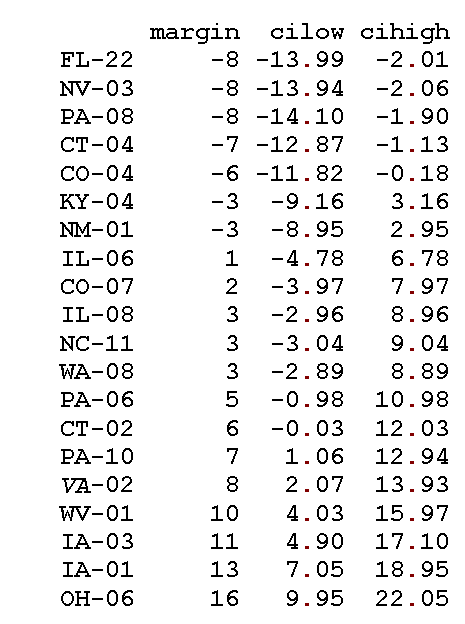 The CNN/ORC rating at 41 by itself would pull up the trend, but that is balanced in this case by the low from Zogby and the close estimates from Cook and Fox. Further, the house effects of these four polls are not extreme. Fox is only a +0.64 for example. Still, three of the four polls do have mild to moderate positive house effects, balanced somewhat by Zogby's negative one. So this may have contributed a bit to the rise in estimated approval trend. But not likely by too much. So the bottom line is that estimated approval now stands at 38.7%, with a slight hint that this may be inflated by the house effects. But I think the bigger story is that the trend estimator continues to be pulled up a little bit, or down a little bit, depending on which recent polls have come in. This is the story of the last two or three months. Approval has (so far!) not been consistently up or down, and the fluctuations we've seen in the trend estimate have often been reversed by a handful of later polls. So, maybe up a point or more. But I wouldn't bet a lot either way. Yet.